More than 200 years after their historic expedition, Lewis and Clark are still part of the national conversation. That was clear the other day on Capitol Hill when Sen. Christopher Dodd invoked the famed explorers’ names to justify federal support of a National Infrastructure Bank. Maybe so. Maybe not. But this much is clear: Dodd’s timing was fortuitous. This month — December 12, to be exact — marks the 206th anniversary of Lewis and Clark’s arrival at an Illinois winter camp on the banks of River Dubois. Five months later, that location would serve as the expedition’s official point of departure for the ultimate mission: American westward expansion. American Detours: Flashback to December 1803. What’s going on? Brad Winn: Well, Lewis and Clark are ascending the Mississippi River. The other part of the river was not actually part of the United States until 1804. So, as Lewis and Clark move up the Mississippi they’re looking at a Spanish- and French-controlled Western shore. [Initially] Lewis and Clark are denied permission to move further up the river. So, they establish a winter encampment directly across the confluence of the Mississippi and Missouri rivers. American Detours: What are conditions like? Brad Winn: It’s a very cold winter. Clark [in his journals] describes ice floes moving down the river — he calls them “great sheets of muddy ice.” We know they arrive at what will become Camp River Dubois, Dec. 12, 1803 — a winter training ground. The men [43, in all] set out building cabins almost immediately. 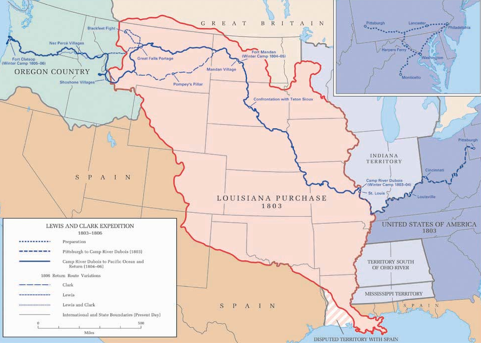 American Detours: Tell us about the catalyst: The Louisiana Purchase. Brad Winn: Thomas Jefferson is interested in expanding the United States west toward the Mississippi. In order to promote Westward expansion Jefferson wants to control the Mississippi River. At the time the French are in the middle of a war in Europe, as well as in the Caribbean and Haiti. Napoleon is more interested in focusing on the war at home. So he offers the United States the opportunity to buy not only the Mississippi River but the whole of the Louisiana territory. When Jefferson asks for clarification as to what exactly he’s purchasing the French simply respond that this is a fantastic offer. It was roughly a penny to a penny-and-a-half an acre. American Detours: We hear a lot about “Lewis and Clark.” What are their individual strengths? Brad Winn: Meriwether Lewis is a logistics guy — but he’s not a people person. He’s not someone who can get the best out of a group at all times. William Clark is. If you’re a military historian, you don’t find too many instances where two leaders command as equals. There’s always a chain of command. But Lewis says, look I need your help. He offers Clark co-command. American Detours: What kind of men are selected for the expedition? Brad Winn: Clark’s looking for good carpenters, good blacksmiths, a good shot. He’s also looking for them to be hardy. These guys will go through pretty intense weather … a lot of hard work. Clark will dismiss some individuals, he calls them “gentlemen’s sons,” unaccustomed to labor. He’s also looking for them to have the ability to work together as a team. American Detours: What’s something people would be surprised to learn about Lewis and Clark? Brad Winn: When I was a kid my image of Lewis and Clark were two guys in a canoe, with a woman pointing the way at the front. There were actually 40-plus men with them. So, it’s impressive to realize how advanced this expedition was, they left with a 55-foot long keelboat. They had a lot of cargo, and a lot of equipment. American Detours: What are some of the majestic things they discover? Brad Winn: If you look at the maps they had at that time, there’s a big blank space right in the middle of North America. They had no idea there was a mountain range like the Rockies in the middle of the country. I can’t imagine what it was like to approach those mountains every day and see them get taller and taller and taller. And then to get to the mountain itself, crest the first range, and see nothing but more mountains ahead. That would have broken a lot of spirits, but these guys stuck to their leaders, they stuck to the plan and pushed through. 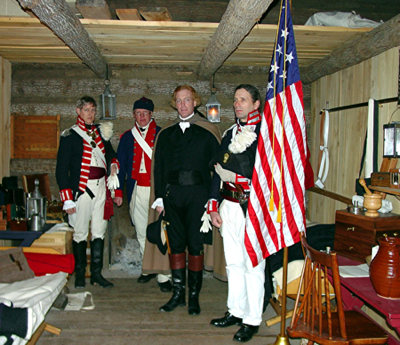 American Detours: You’ve been site manager Lewis and Clark State Historic Site since 2001. What keeps you telling the story? Brad Winn: Just the sheer fascination. This is the first true American story. You talk about George Washington, and the Founding Fathers, but they were part of the British Empire. These guys were either born during or in the middle of the American Revolution. The story has a lot of elements that people can relate to. I don’t mean to sound cheesy but you’ve got the buddy film … it’s action and adventure … they’re on the boat … and there’s a woman involved, so you’ve got the lady interest … and to put it way over the top Lewis has a dog … so it’s a dog film. These guys were just average Americas, and they couldn’t have done it without working as a team. 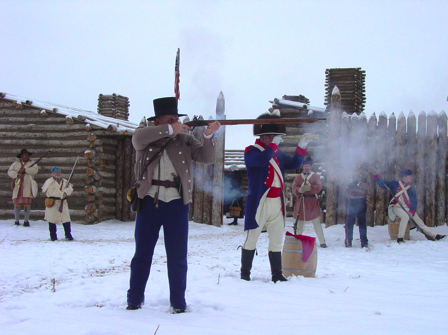 American Detours: From Dec. 12-13, you’ll have reenactors at the camp. What can visitors see? Brad Winn: It’s an opportunity to see what life would have been like for these guys. You know there’s no heaters out in those camps [image, below], there are no thermals … they’re wearing the uniforms they wore back in the day. As far as the average day, they’ll go through their routine, inspection, there’ll be firing drills. American Detours: How else can people learn more about Lewis and Clark? Brad Winn: You know, I can talk about Camp River Dubois, but until you stand in the middle of that cabin, in the middle of the winter — until you see these guys in uniform hovered around a fire, and see the ice floes coming down the Mississippi River — you can’t fully experience it. History’s a lot about location. If you want to live part of that location, you have to come see it. Great work. I’ve been to the Lewis and Clark site in Hartford, Ill. several times and know Brad well from my visits. Sorry, but as an old reporter for VOA, I had to make sure you knew. Please don’t take offense. You are performing a great service for the rest of us, one that most of us are to lazy to attempt.